THERE is a remarkable similarity in the lives of Maharaja Ranjit Singh (1780-1839) and Napoleon Bonaparte (1769-1821). They dominated the East and the West in the later part of the eighteenth and the beginning of the nineteenth century. Pitted, ironically, against the same arch rival, the British, they maintained a heroic stand. Their empires had as many similarities as did their personal lives. Not only were they men of a short physical stature and enjoyed short life-spans, but they had an unmatched appetite for territorial aggrandisement, possessed prodigious administrative acumen and were also almost equally struck by Cupid. Before examining some of the interesting facts of their personal lives, it is worthwhile to study the remarkable similarities in the ethos inherited and created by them. Napoleon Bonaparte reaped the benefits of the French Revolution of 1789 during which the traditional French monarchy and ancien regime were discredited and ordinary citizens gained significance in the affairs or the state. Against this backdrop it was not difficult for Napoleon, the son of a ‘harlot’, to rise to the throne of France. Napoleon grew up in an atmosphere of extreme poverty and received no formal education. Maharaja Ranjit Singh and Napoleon Bonaparte were great generals and benevolent despots. Maharaja Ranjit Singh, though born in the family of the Shukarchakya Misl Chief, was equally unbridled and uneducated. The Sikh chief, due to his war-like qualities, rose to head the Shukarchakya Misl which established its hegemony in Lahore, after defeating the Bhangis . This culminated in his assuming the title of a monarch by Maharaja Ranjit Singh. So like Napoleon, he saw the Crown ‘lying on the ground and picked it up with his sword’. Both of them rose to be self-appointed monarchs not by inheriting blue blood derived from any established lineage but by a strange legitimacy conferred on them by the people themselves. Both, Napoleon Bonaparte and Maharaja Ranjit Singh, were great generals and benevolent despots. While capturing more and more territories, they gave to the people pragmatic systems of good governance which helped in consolidating their victories and won the hearts of the population they governed. Napoleon Bonaparte was, in the words of David Thomson, a "usurper legitimised by the will of the sovereign people." 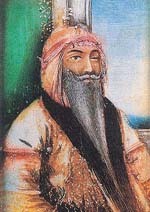 Maharaja Ranjit Singh consolidated the Sikh empire by a sound civil and military administration. He revitalised and improved upon the system of collection of revenue and divided his area into subas, parganas, talukas and mouzas. He did not hand over any fixed statute like ‘Code Napoleon’, but the system of delivering justice based on usage worked extremely well. He evolved the doctrine of collective responsibility of the village for the crime. This innovation is the precursor of community policing of today. Both, Bonaparte and the Maharaja, possessed great love of the horses which constituted an important part of their cavalries. Both the potentates were keen horsemen. Napoleon Bonaparte could take his nap on the horseback. Once, while having a cruise in the Rhine, we were pointed out a fort which was razed to the ground by Napoleon in rage during one of the campaigns because his horse got frightened by the sound of cannon emanating from this Fort. Maharaja Ranjit Singh is known to have spent Rs. 60 lakh and sacrificed 12,000 soldiers in gaining the famous mare Laili from Sultan Mohammed. He risked the lives of Raja Sher Singh and General Ventura to get the famous mare for him. Maharaja Ranjit was always open to gifts of horses and accumulated nearly ten thousand of them. The French monarch is known to have had at least three torrid love affairs. His first love was a petite girl of 17 years called Desiree. It was perhaps the humble beginnings of Desiree which did not satisfy the growing aspirations of Napoleon Bonaparte. During one of his battles he met the ‘incomparable Josephine’. Josephine was married to Viscount Alexandre de Beauharnais who was beheaded during the Reign of Terror. She had two children, Hortense and Eugine. The pretty widow, though no longer young, had the graces and coquetry of the old regime. She herself had narrowly escaped the guillotine and was living life to the fullest in search for a rich and powerful protector. Having seen her, Napoleon forgot poor Desiree and fell hopelessly in love with her. She stood for everything feminine and elegant. 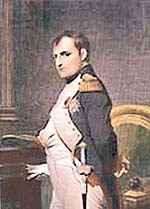 Even though Josephine did not think much of the young General Napoleon Bonaparte, she flirted with him anyway just as she did with many others, including General Paul Barras. Napoleon Bonaparte and Josephine married at the town hall on March 9, 1796, in a civil ceremony. On the marriage certificate, Napoleon wrote that he was two years older than he actually was, and Josephine took four years off her age, of 33. During Napoleon Bonaparte’s stay in Poland, he had a passionate love affair with an 18 years old Polish girl named Maria Walewska. Since the 1770s, Poland had been divided between Austria, Prussia and many Poles looked to Napoleon to free their country and restore its independence. Maria was one of them. The wife of an aging Polish count, she had disguised herself as a peasant girl and stopped Napoleon’s carriage to beg for peace and liberty for Poland. She soon disappeared into the crowd, but not before catching Napoleon’s fancy. Demanding that his officers locate her, Napoleon went to Warsaw, the Polish capital. When Maria was finally found, Napoleon sent her a special bouquet of flowers made of diamonds. Maria flatly refused this overture. It seemed that all of Poland tried to change her mind. It was the general belief that she alone could persuade Napoleon to restore Poland to its original boundaries and former glory. Even her friends felt that it was her patriotic duty to sacrifice her own feelings and become Napoleon’s mistress. Finally, unable to resist such pressure she gave in. But then Maria actually fell in love with him as she left her husband and in the winter of 1806-07 a torrid affair for Napoleon. In spite of his exalted position, Maharaja Ranjit Singh underwent religious punishment for parading in the streets of Lahore, on elephant back, in the jubilant company of his queen Moran known as Moran Sarkar. His association with Rajbanso, Guddan and Billo wove legends of romance in his name. Maharaja Ranjit Singh struck a coin in the names of Rani Moran. Maharani Gul Bahar Begum was one of the leading Muslim members of the harem. Rani Jindan, the last of his ranis, had a questionable past and she was clandestinely linked with Raja Lal Singh, whose perfidy in the Anglo-Sikh wars proved decisive while vanquishing the Sikhs. Fortunately, none of his traditional maharanis was the subject matter of any public scandal. Jacquemont, a French traveller, while visiting the court of Maharaja Ranjit Singh, wrote about the Maharaja’s virile lifestyle. Among other things, Maharaja Ranjit Singh talked to him of the aphrodisiacs with which the French used to enhance their sexual performance. The maharaja himself was very fond of drinking potions made of expensive herbs and stones. While partaking a toast of Maharaja’s hospitality, Jacquemont felt that a draught of wine set his system on fire. Lepel Griffin says "The Sikh monarchy was Napoleonic in the suddenness of its rise, the brilliancy of its success and the completeness of its overthrow". Both the monarchies fell to a superior imperial power, the British whom they had kept at bay by war and diplomacy for a number of decades. Some of Napoleon’s commanders like Ventura and Allard later joined Maharaja Ranjit Singh’s army after Napoleon was taken prisoner by his European conquerors.